Watch Carole Lynne on Fox's Strategy Room! 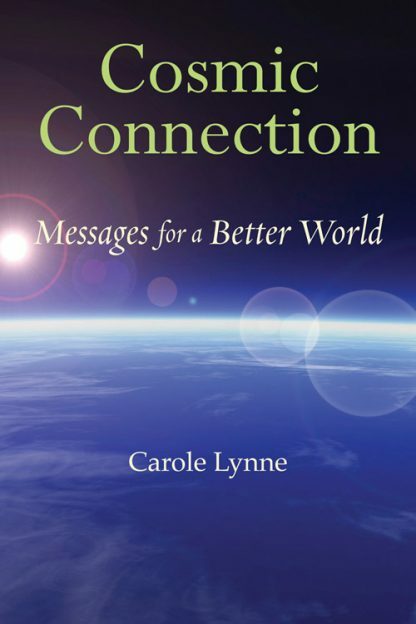 In a bold departure from her earlier books, medium and psychic Carole Lynne shares the story of her own growing revelation of the interconnected, interplanetary, cosmic energy that flows around and through us all, that is, indeed, the stuff we are made of. Experience Carole Lynne's journey of a lifetime as she goes into an altered state of consciousness and brings messages from "My Guidance" and "The Energy." Receive a glimpse into the nature of the spiritual forces that have created us and continue to manifest life. Evolution is not over! The future of our world depends on our abilities to evolve in a positive way: to let go of our egos, to realize that we are not separate beings, and to evolve to a consciousness that finds poverty, pollution, and war unthinkable. We are responsible for the future. But how can we change in order to have better personal lives and to make better choices for our world? As we enter the second decade of the new millennium and a seeming meltdown of economic and societal infrastructures more and more people are turning to other realms for solace, advice, and the tools they need to live every day. In the past when this has happened (during the Great Depression or WWI, for example) a great deal of material from other realms was given to us. Carole Lynne�s work joins that of her predecessors and her contemporaries in providing that information for tomorrow�s world.